Traditional Mexican caramel sauce made from goat's milk. Surprisingly simple to make - drizzle it over fruit or Mucho Mango Tart, spread it on toast or between the layers of a cake, stir it into your coffee or just eat it with a spoon. A jar of Cajeta de Leche made in the Adventure Kitchen. If you can stop yourself from eating it, you can keep it in a jar in the refrigerator up to 3 months. 1. Stir the baking soda into the water and set aside. 2. Pour the milk into a heavy-bottomed pan such as enameled cast iron, or whatever your heaviest pan is. A pan that is too thin can heat unevenly and burn the Cajeta. Baking soda stays behind when water has been poured out. 3. Stir in the sugar and bring the mixture to a boil over high heat, stirring occasionally. As it begins to boil, the milk will bubble up and significantly increase in volume, so stay close and keep an eye on it. 4. Turn the heat to medium. Pick up the cup with water and baking soda in it, and carefully pour only the water into the goat's milk mixture in a thin stream, leaving all the baking soda behind in the cup! Stir the water into the goat's milk mixture. Be careful - the mixture will foam up even more when you do this! If it threatens to boil over, turn the heat down a bit until the bubbles subside. Keep stirring until the bubbles have died down, then return the heat to medium. 5. Continue cooking the mixture over medium heat for 50-60 minutes. For the first 20-30 minutes, you can stir every few minutes. At this point, you will notice the milk is beginning to turn a slightly nutty brown color, and you will need to stir the mixture a bit more frequently from here on. Cajeta starting to darken after about 25 minutes. Coating the back of a spoon - almost finished! 6. As time passes, the Cajeta mixture will get progressively darker brown. As it browns, you will need to stir it more often, until by the end of cooking you will be stirring it constantly to be sure it doesn't burn. 7. As you near the end of cooking, the Cajeta will be quite thick and will "coat the back of a spoon," which means that if you were to run your finger across the back of a spoon, the line would remain and the Cajeta would not run together. Turn the heat to medium low and continue to mix and stir. When it's finished, it will no longer appear creamy, but will have a slick, rich caramel color and appearance. 8. Turn off the heat and carefully (it's hot!) use a rubber spatula to scoop all of the Cajeta into a bowl to cool. Stir in the vanilla extract as it cools. You can stop cooking the cajeta when it reaches the consistency you're looking for, depending on what you plan to do with it. If you want to drizzle it over ice cream or fruit, you'll want to stop a tad earlier, so it's still soft and liquidy enough to do this. If you want to end up with a firmer consistency, cook a little longer. 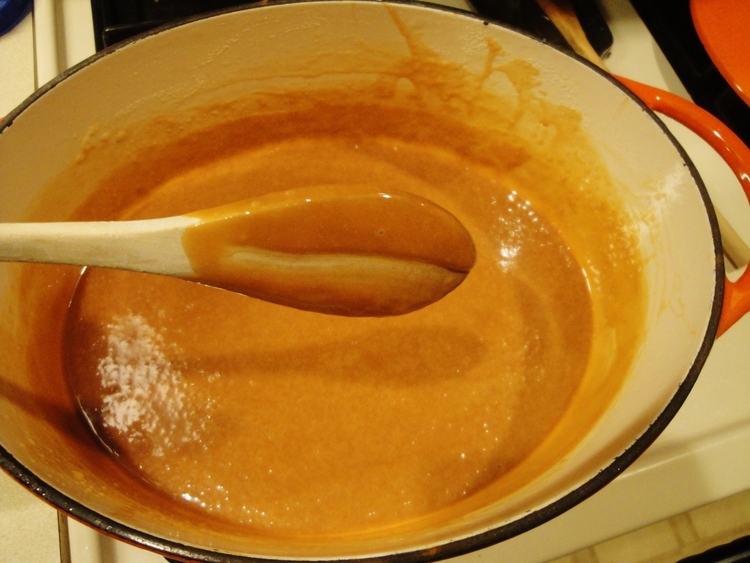 Cajeta will thicken as it cools, so it can be a bit tricky to judge when it's done to your liking. If you accidentally let it cook a little beyond the consistency you had hoped for, you can stir a little extra milk or splash of water into it over medium-low heat to bring it back to a more drizzly consistency. You can make Cajeta de Leche ahead and store it in a jar in the refrigerated for up to 3 months.